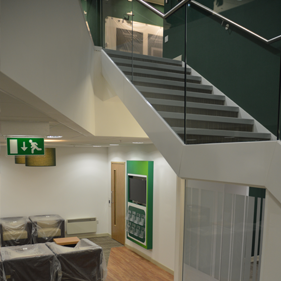 The redevelopment of a retail store into a bank required the removal of a large triangular area of floor to gain stair access and a sense of space to the basement and ground floors. 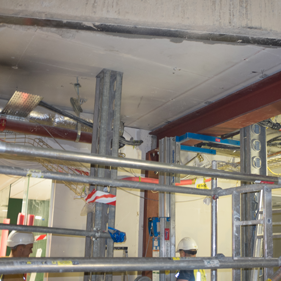 Stress UK were commissioned to design and install a carbon fibre structural reinforcement system to enable the ground floor slab to span safely. Analysis showed that due to the relatively thin slab, the size and shape of the hole, the position of remaining down stand beams and columns that the carbon fibre alone would not suffice. Stress UK then designed and installed a composite scheme of carbon fibre and conventional steel work to provide the necessary elegant stiffening and support required. The scheme provided a very cost effective solution which with the rapid installation allowed the main contractor Styles and Wood to maintain their tight programme. Woven in single uni-directional strands. 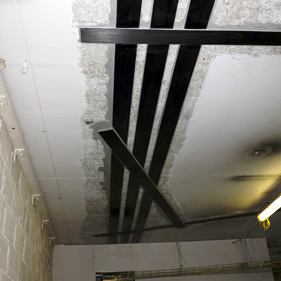 We positioned the carbon fibre structural beams system to support the ceiling where the old triangular wall had been removed. 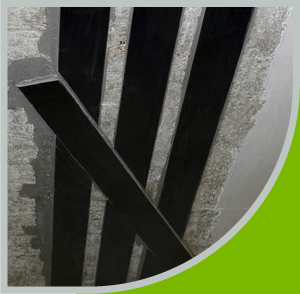 The design for the carbon fibre reinforcement was supplemented by additional steel beam strengthening. Once all the necessary strengthening was complete the basement area could be easily accessed with the benefit of a renewed sense of space.